Hello to all you See Sarah Swatch lovers! I'm Rachel from Top Coat It and I'm thrilled to be here on the third day of our Share the Love voyage. If you read any crafting or home décor blogs you've seen the chevron craziness sweeping the nation. 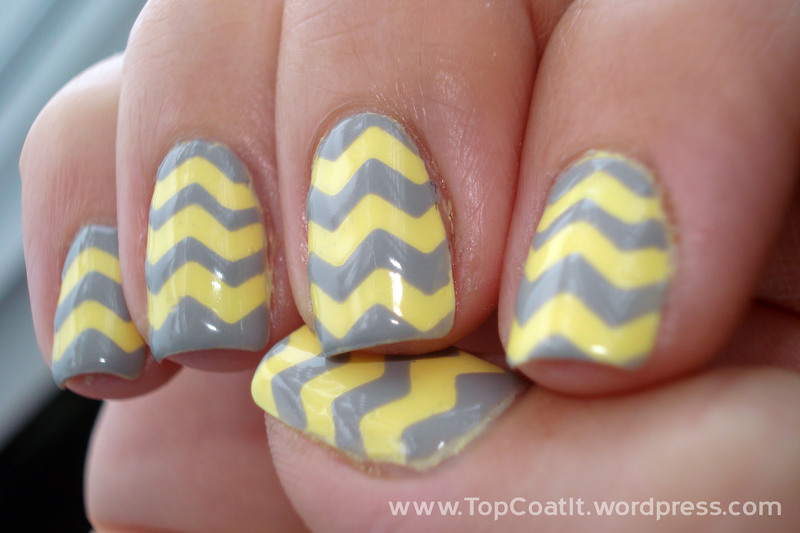 Chevron nails have been on my mani to-do list for a while. I eagerly took this opportunity to try it. Yellow and grey is one of the trendiest color schemes right now so I jumped on that bandwagon too. What do you think? I think they're awesome! I love them. I think I would love them even more mattified, but I have yet to find a matte top coat locally and haven't decided on one I want to order online. Do you have a favorite matte top coat? I started with Sinful Colors Unicorn as my base color, which I haven't been very impressed with. You need at least 3 coats to get decent coverage and no matter what I do it bubbles. I had to take it off and start again. In an effort to keep the bubbles at bay, I painted my nails white with Sinful Colors Snow Me White first. That helped a lot. Noted; next time I want to use Unicorn, put white under it so one good coat is enough. The grey is Sally Hansen Wet Cement. 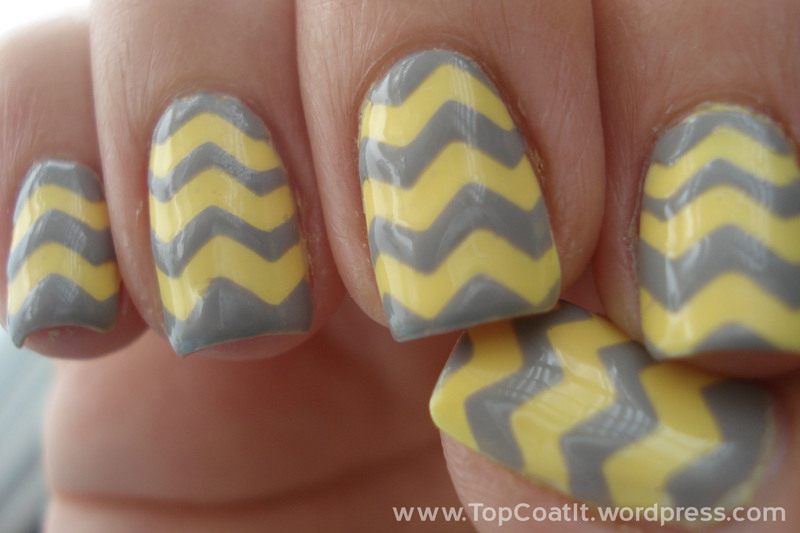 I loved getting creative with tape manis. I'll be posting a quick tutorial on how I did these nails on my blog sometime next week so watch for that at Top Coat It. Check out my guest post tomorrow at Amandalandish. Thank you so much for having me over today Sarah! So pretty! must have taken forever, but looks worth it! I've heard the Essie matte top coat is a good one.